This is a beautiful cabinet, it's real wood a dark cherry...it comes fully assembled. The baskets come already fitted inside the cabinet...their a little hard to pull out, I'm going to try the old soap trick...not all of them are this way...I would upload a picture but don't see here where I can. For the money you can't go wrong with this little gem. Safavieh Cape Cod 6-Drawer Dark Cherry Storage Unit - 29.9" x 13" x 27.6"
Safavieh Herman Red Storage Unit - 29.9" x 13" x 27.6"
Safavieh Cape Cod 6-Drawer Black Storage Unit - 29.9" x 13" x 27.6"
Safavieh Herman White Washed Storage Unit - 29.9" x 13" x 27.6"
Country charm with an Easy-going twist characterizes this CapeCod 6-drawer storage unit from Safavieh. Featuring four wicker baskets, as wellas two top drawers, this piece offers ample storage space while providing anadditional surface for lamps, books, flowers, or other treasured accessories. Constructed with a sturdy pinewood frame in a dark cherryhue, this storage unit has a contemporary and functional design. The contrastof natural wicker with dark hardware makes this a piece of distinction, addingclass and an organic vibe to any decor. Its quaint disposition ensures that itwill work equally well in a compact apartment or a spacious family room. Dimensions 27.6 in. H. x 29 in. W. x 13 in D.
I ordered it twice I received the first shipment damaged...Kudos to Overstock they immediately sent out a new one after viewing the pictures. The second came in great. However I had noticed the baskets seem to begin to shred when you pull them out so I corrected that problem with a sheet of HARDBOARD I bought from Home Depot. After I cut to size and installed them the baskets pulled out great and it even looked better. .. 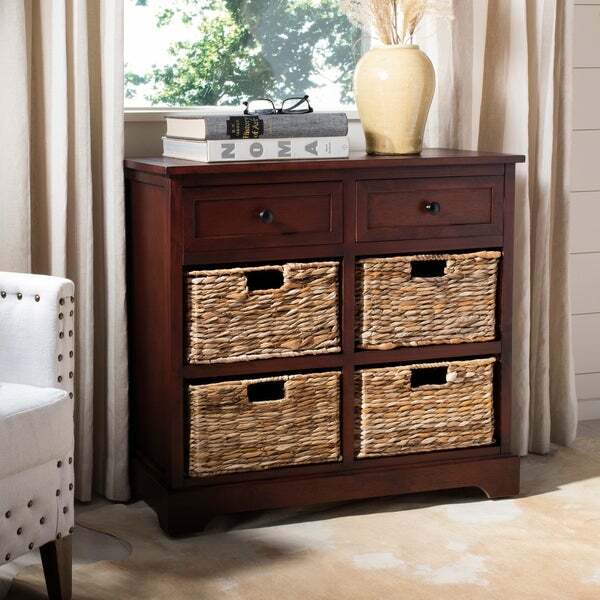 I ordered the Safavieh Cape Cod 6 drawer Storage Unit in the Dark Cherry finish. The color looks fantastic, just like the picture. The 4 wicker basket drawers are great. All 6 drawers are easy to pull open to use. This arrived within just a few days. Perfectly boxed up, no damage at all. Easy to unpack also. Love it... I would definitely recommend this unit to friends! Perfect storage solution in living room! Another A+ for Overstock! This storage unit comes in a large box (pretty fast might I add) and is PUT TOGETHER ALREADY! YAY! The baskets hold a good bit..and the top drawers are nice too. The wood is nice...and I have pottery sitting on the top. Perfect for my needs, really pretty, and NO ASSEMBLY! baskets are flimsy and do not pull out and slide in easy. Does not hold 8 x 11 paper. drawers are small. would not recommend. Not happy with my purchase. I am thrilled with this storage unit. The color matches my bookcases in my den perfectly, and has a beautiful color and finish. It fits perfectly until my 80" TV. I use the top of it to hold my sound box, VCR/DVD and cable box. The baskets are an ample size for storage and the drawers move smoothly back and forth. I bought two units and placed them together, and they fit well against each other. They are an attractive addition to my den. A friend saw them and loved them immediately. Unit came pre-assembled and doubled boxed without any damage. The shipping on this storage unit was really fast and the box weighed a little over 40 pounds. I love the look and quality of this piece and would highly recommend this item. I love this piece but its smaller than I expected. The color is a very dark brown which I love. The quality is good but I think the price was high for this piece. Not good for using drawers regularly. I love the look of this storage unit, and it goes well with my decor. The biggest issue is that the drawers, although functional, are not good for daily use. These are more decorative than functional, as they do not have a smooth bottom to slide easily from the cubbyholes. The grass weave is beautiful, but tends to catch on the cubbyhole edge, making a mess as the grass is compromised. The drawers do not move easily, and it takes a little effort to get them back in evenly. I still love the look. I just wish that there was a smooth surface on the bottom of the drawers to allow them to move smoothly into and out of the cubbyholes. I bought two of these units as bedside tables. They are a good size and came fully assembled, which was great! I'm not a fan of the baskets, they seem cheap and are rough. One thing I wasn't expecting and don't like: there are no shelves beneath the baskets. I was thinking if I didn't like the baskets, I would just remove them and use the spaces as shelves for books or what not. Not an option. Take the baskets out and there's just an open space, with strips of wood around the perimeter to support the basket. This will also affect what can be kept in the baskets. Nothing too heavy since the bottom of the baskets aren't supported. So even though I will make them work for my purpose, I wouldn't recommend them. I love this piece. Very well made. Attractive too. I bought this to keep hats, scarfs, gloves etc by the front door since I no longer have a coat closet in my new condo. It works perfectly for that, and looks very nice. It's not that big of a deal to pull the baskets in and out, as long as you know it's not like having drawers. I especially loved that it came all put together. I was a bit about the color would look like bit I really liked it once I saw it . Very nice quality . Will be perfect for what I wanted it for. I would recommend this to others looking for a smaller piece to store items in... great price too! Nice. Finish is a little irregular but it did say rustic. Good for the price of others I have seen. I really like it. Will serve the purpose VERY WELL. Nice storage unit. Baskets a little clumsy to get in and out. Nice, but not too crazy for the baskets. The weave is thick and catches as you pull them in and out. "I wanted something to put in my kitchen to hold kitchen utensils. Measure cups, wooden spoons, etc. Are the baskets strong enough to hold these items." Yes, the basket are well made and sturdy and will likely hold your kitchen utensils. "One review stated there was no shelf under the baskets. What do the baskets sit on?" Hello, LucyH. The baskets are supported by the outside lip of the shelf, as well as lips on the inside of the shelf. Thank you for your question, have a great day! Safavieh Cape Cod 3-Drawer Dark Cherry Storage Table - 15.9" x 13" x 27.6"